The Shubunkin Goldfish have a wild calico patterning set on a blue background... a color that is quite rare in goldfish! The Shubunkin Goldfish are beautiful fish that are almost always speckled or have a variegated color pattern. However, what makes the Shubunkin's appearance unique is not their wild calico patterning, but their blue color. Blue is a color that is quite rare in goldfish. The Shubunkin are called Chuwen-chin in China. But in Japan, where they were probably developed in about 1900, they are called Shubunkin, and this is the name that they are known by throughout the western world. Shubunkin Goldfish can have many colors in its patterning, which has led to it often being referred to as the Calico Goldfish. These colors include yellows, oranges, reds, browns, blacks, purples, grays, and whites, all set on a blue background. Other descriptive names for this fish are Speckled Goldfish, Coronation Fish, and Harlequin Goldfish. The blue coloring is quite rare, which makes the Shubunkin a more valuable goldfish. There are two types of Shubunkins, the London and the Bristol. The London type is much more common than the Bristol type and is usually what you will find at pet stores. Both types of Shubunkin Goldfish, especially the London type, as seen above, are recommended as a beginner fish. These fancy goldfish are one of the hardiest of the goldfish varieties. They are an easy fish to keep as they are not picky and will readily eat what is offered. They are active and strong swimmers. They are also very social and thrive in a community. Other goldfish recommended for beginners include the Fantail Goldfish, Common Goldfish, and the Comet Goldfish. The Shubunkin Goldfish was probably developed in Japan around 1900. Other common names they are known by include Calico Goldfish, Speckled Goldfish, Harlequin Goldfish, and Coronation Fish. Today, domesticated goldfish are distributed world-wide, and the Shubunkin is one of the more than 125 captive-bred varieties of goldfish. The Shubunkin Goldfish is an elongated, flat-bodied variety of goldfish. The head is wide but short, and its body tapers smoothly from its back and belly to the base of its caudal fin (tail fin), which is forked. Its fins generally stand fully erect, and the edge of the dorsal fin is slightly concave. The average goldfish lifespan is 10 – 15 years, though living 20 years or more is not uncommon in well-maintained goldfish aquariums and ponds. There are two types of Shubunkins, the London and the Bristol. The London type is very similar to the Common Goldfish, having the same body and fin shapes. The Common Goldfish, however, is larger and has completely different coloring--a solid bright orange. The Bristol type Shubunkin has an enormous tail fin that is very wide and moderately forked with well-rounded lobes. The Shubunkin Goldfish is somewhat smaller than the Common Goldfish. The environment it is kept in is a determining factor in whether your pet will grow to its full potential size. In an average 15 gallon tank, if well cared for and not crowded, they will grow up to about 5 inches (12.7 cm). In a bigger, uncrowded tank, they can grow larger generally reach about 6 inches (15 cm), though some hobbyists report their Shubunkins reaching up to 13" (33 cm). In some cases, they even reach a whopping 18" (43.7 cm). Shubunkin Goldfish can have many colors in its patterning. These colors include yellows, oranges, reds, browns, blacks, purples, grays, and whites, all set on a blue background. The color blue is quite rare, which makes the Shubunkin a more valuable goldfish. Size of fish - inches: 18.0 inches (45.72 cm) - About five inches is a likely adult size for the Shubunkin Goldfish. But they can reach up to 18 inches in exceedingly well-maintained large tanks and ponds. Lifespan: 15 years - The average goldfish lifespan is 10 – 15 years, though living 20 years or more is not uncommon in well-maintained goldfish aquariums and ponds. These goldfish are hardy and easy to keep in a well-maintained tank. Minimum tank size is 15 gallons, so make sure water changes are frequent in such as small tank. Regular weekly water changes of 1/4 to 1/3 are strongly recommended to keep these fish healthy. Snails can be added as they reduce the algae in the tank, helping to keep it clean. Fifteen gallons is the absolute minimum required to house a Shubunkin Goldfish. It's best to start with a 20 - 30 gallon tank for your first goldfish and then increase the size of the tank by 10 gallons for each additional goldfish. Providing a large amount of water per fish will help dilute the amount of waste and reduce the number of water changes needed. Goldfish are a cold water fish and will do best at temperatures between 65 - 72° F (18°- 22° C). The Shubunkin Goldfish are one of the hardiest varieties of goldfish and can tolerate temperatures a few degrees above freezing, as long as the cooling drops only a few degrees a day. A quick temperature drop can kill them, so if you live in a very cold climate a heater is advisable. Most aquariums come with a cover that includes lighting. A cover for the tank is desirable as it reduces evaporation, and though they are not prone to jumping, on occasion some goldfish will jump out. Lighting is not essential for goldfish, but does make the aquarium a nice showpiece. Lighting will also help if you have live plants. Minimum Tank Size: 15 gal (57 L) - This fish is very active and very messy. It requires a lot of room to swim in and excellent filtration to keep it healthy. Goldfish are very social animals and thrive in a community. Not only are they a great community fish, but they are great scavengers as well. It is really not necessary to add other scavengers or other bottom feeders to the aquarium when you have goldfish. LIke most fancy goldfish, they will thrive in both freshwater and tropical aquariums as long as there are no aggressive or territorial fish in the tank. Some good tankmates for fancy goldfish are the Chinese Blue Bitterling and the Northern Redbelly Dace. Shubunkin Goldfish are egg layers that spawn readily in the right conditions. They can be bred in groups as small as five individuals, but they are very social animals and likely to breed in larger groups as well. The only time Goldfish will spawn in the wild is when spring arrives. To spawn them in the aquarium, you will need to mimic the conditions found in nature. The Shubunkin Goldfish are readily available in fish stores and online, but they sometimes cost a bit more than other fancy goldfish. i have a 60 galon aquarium. 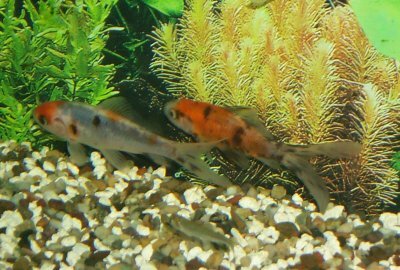 it has a mixture of species (oranda, red cap, calico goldfish) with a pair of shubunkin (~4 inches). i recently added a pair of black oranda gold fish but my shubunkin bit them on their sides and pectoral fins so i had to remove the black oranda. why is that??? I had 2 Oranda red caps for more than an year when I added 2 shubunkins to them and shubunkin started chasing and biting the Orandas. I donno if that was the reason but after bringing shubunkins my grown up Orandas died within a month. Being an ex pat from UK now in Latvia building the last bits of our house. I have a big landscaped garden of 2 acres done by myself. I want a large liner pool under a rock water fall. Shubunkin fish but on line where to buy them.Nothing like it here as winters are cruel no one keeps fish outside. My pond is big and deep enough for fish to survive anything. Now can any one assist in fish buying on line?? Thank you. my shebunkin fish keeps sieving from the top (like gasping for air) alot???? what is wrong, i don't know what to do, please help. thankyou. It sounds like there is not enough oxygen. They will go to the top and gasp for air when there is not enough oxygen. Increase aeration, either surface movement with a powerhead or more bubbles with an air pump. A partial water change might help as well. Get some algae. It may not be pretty, but it will get the job done.